The family of a security guard who was shot and killed by police after a shooting at a suburban Chicago bar over the weekend has filed suit, calling the guard's killing "unprovoked" and "unjustified." 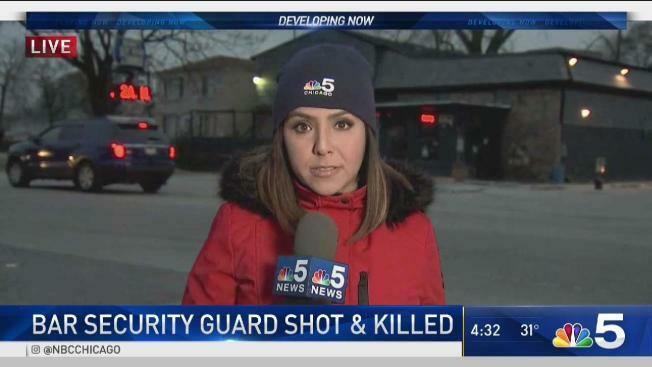 NBC 5's Lisa Chavarria has the latest. The family of a security guard who was shot and killed by police after a shooting at a suburban Chicago bar over the weekend has filed suit, calling the guard's killing "unprovoked" and "unjustified." The federal civil rights lawsuit names a Midlothian police officer, identified only as John Doe, and the village of Midlothian in the shooting death of Jemel Roberson. Authorities said 26-year-old Roberson was working security at Manny's Blue Room in Robbins when police responded around 4 a.m. Sunday to a call of shots fired. Midlothian Police said they arrived to find multiple gunshot victims at the bar and an officer at the scene opened fire on "a subject with a gun." That man was Roberson, an armed security guard at the venue. Four other people, including a man believed to have fired a gun during the initial shooting, were shot and wounded before police arrived, but their injuries weren't considered life-threatening, authorities said. According to the lawsuit, Roberson had "apprehended one of the perpetrators and was holding him" when the Midlothian officer came on the scene and fatally shot the guard. Police have not confirmed that account. Roberson was licensed to carry a firearm, Cook County sheriff's spokeswoman Sophia Ansari said. No details have been released about the officer. Roberson was the only person killed in the shooting. Family members said Roberson was a family man who had been working in security for several years. He also played the organ in multiple churches in the Chicago area. Robbins police Chief Roy Wells told reporters Sunday the initial shooting stemmed from an argument. The Village of Robbins Mayor Tyrone Ward, issued a statement saying, "the Village of Robbins Department of Inspectional Services, along with the Office of the Mayor has ordered the nightclub temporarily closed pending the outcome of a review and full examination of the facility."